More Rassvet goodness is coming your way, as the 5th collection drops on our shores. Collaborating with Russell Athletic & Hi-Tec, the collection features plenty of classic athletic products as well as denim, straight pats, and striped shirts, which have been introduced to present a full Rassvet silhouette for the first time. Graphic collages were lifted from the the team’s scribbled research logos and implanted onto several pieces. Rassvet’s skate roots are still kept intact, as more logo shirts are made available for OKTYABR. The collaborative pieces are where it gets interesting. 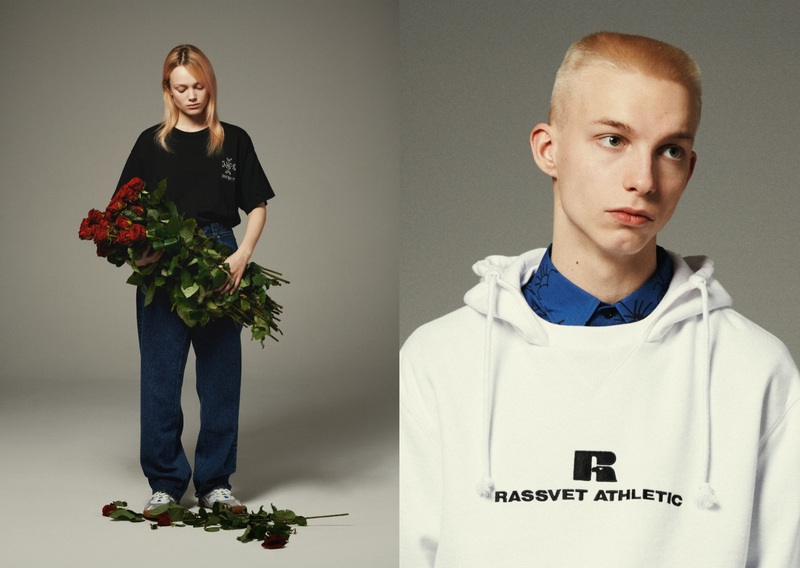 Russell Athletic’s logo gets hijacked and reintepreted as Rassvet Athletic as well as Hi-Tec’s graphics being displayed alongside Rassvet co-branding. Of course, the collaborations aren’t just simply an excuse however, as both of its partners contribute to the Rassvet image and feel. Russell Athletics provides a true to the Americas heritage, holding the title of the inventor of the sweatshirt, which inspired the varied sweatshirt shapes bearing sports team graphics, of which were prominently featured in the capsule. Hi-Tec contributes a reworked version of their Squash shoe, including gum outsole and full grain nubuck toebox to offer excellent support, essential for not only just squash, but skateboarding. All of this is rounded up with their motto: RASSVET NE ZA GORAMI, or “The sunrise is not far behind the mountain.” Rassvet’s newest collection will be available at Krookz Kuala Lumpur very soon.